Happy Flash Friday everyone! I know, I know, you’re probably expecting me to update you on my big comic decision. Well, real life got in the way of that and I won’t be able to get to the store until this weekend. That’s okay, because I really wanted to talk about Peanuts anyway. Over at Speedforce.org Kelson is looking for sponsors in the Walk for Food Allergy. I really recommend you go read what Kelson has to say about FAAN and food allergies. I’m extremely lucky not to have any food allergies myself and I hope that my son ends up not having any of them either. Considering half the people that read Flash Friday come here because of Kelson, I obviously want to support him as much as I can. The fact that it is a great cause just makes it even easier to talk about it. So click HERE to make a pledge. 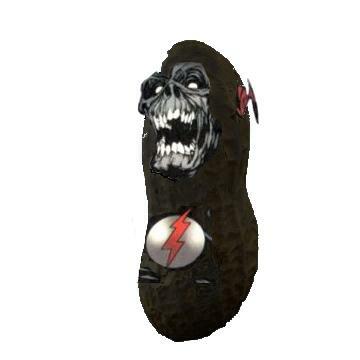 And if the Black Flash Peanut causes anyone to have nightmares, I’m sorry. Thank you so much for the promotion and the donation!